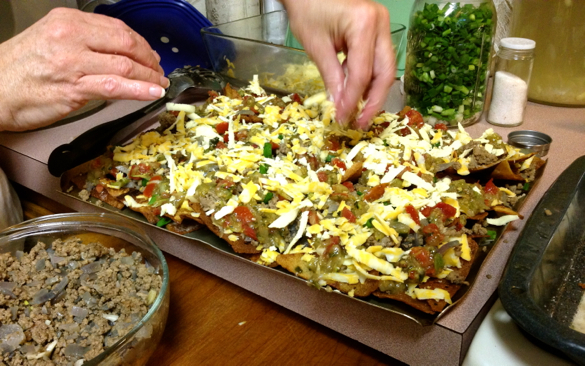 How To Make Delicious Nachos, From Scratch? Yummy! Nachos, from Scratch. Oh, Yeah. We often eat lunch with my friend Jami and her kids on our days in town. I try to bring something to contribute, while she always provides a nourishing main dish. We love making a stop for good food, fellowship, and rest, especially on our long errand days. Jami loves nachos. She's eaten them all her life, especially the take-out kind. As a stay-at-home mom eating real foods, she figured she had to find a way to keep eating them — at home and healthy. So she did. We were playing a game during one visit, and nachos came up, and of course we all said how much we wanted to eat them. Jami said she'd make them for us soon, and I said we should make them using the best tortilla chips ever (my specialty). Here are some quick print instructions. Start with sourdough crepes and fry them according to these instructions: The Best Homemade Tortilla Chips. Ever. Preheat oven to 350 degrees F. Carefully spread out chips on in a single layer on a baking tray. Then add a second layer of chips, filling up all the holes in the first layer. Jami says to do this so every chip gets toppings on it, and no toppings fall through. It really worked! We topped with shredded cheese (we used some of my homemade cheddar), green onions, seasoned beef, salsa (dripped out so it is not so wet), and more shredded cheese. And a sprinkling of green onions on top for color — another of Jami's tips to make these nachos better than your average homemade nachos. Use whatever toppings you've got — we often use refried beans, diced onions, sliced olives… whatever you've got. Load them up! 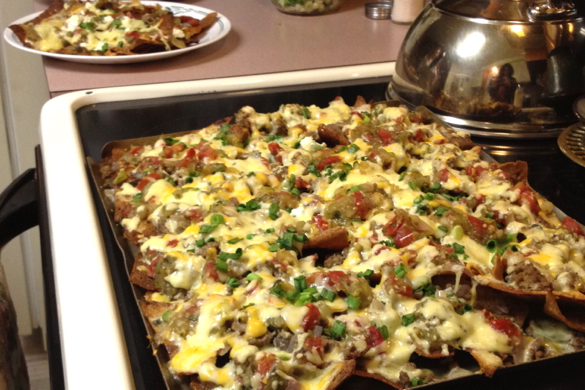 Do you make homemade nachos? What are your favorite toppings? This post is shared with Simple Lives Thursday, Pennywise Platter Thursday, and Fight Back Friday. These look great! I was just wondering what “finger food” we could have for dinner tonight and I think I found it 😀 Thanks for sharing. We love them with refried beans, seasoned chicken, cheese, and then olives jalapenos lettuce and tomato and sour cream on top after they cool slightly. We like the works, but whatever we have on hand is yummy 🙂 mmm I will have to make these tomorrow! I don’t make my own chips though, but buy organic corn and seed chips or fry good corn tortillas in red palm oil. On the menu for tomorrow night. Looks great. WOW those look great! As I consider Mexican food to be one of the major food groups, I sooo appreciate a healthy option! I am getting ready to start your cultured dairy course and am so glad to have found it since we eat a lot of cheese and sour cream. Blessings! Green chiles! You’re missing fire roasted green chiles. 😉 But otherwise, it sounds super yummy. Ooh. These look amazing! Nachos are one of the few things that I miss on GAPS. I love nachos but I haven’t figured out how to make a grain-free chip substitute. I like to load mine up like you did here, too. Found your post at Fight Back Friday – my mouth is WATERING! No worries they are in there! I combined my typical red salsa with my roasted green chili salsa to add more chili flavor. These turned out so good. I also love the chicken & roasted garlic nachos as well. Due to changes in our diet we are not eating as many beans so this batch was garlic/onion beef. But I do love those homemade re-fried beans….. yum! Kari, actually there were green chiles in the salsa! Yes, but feel free to use non-gmo corn tortilla chips! Now that looks seriously too! These sound terrific although a lot of work. I think it would probably be best to make the crepes one day and then make the nachos another day. Those look great! I haven’t made anything sourdough since before Thanksgiving…and haven’t even been feeding starter, wonder if I’ll be able to revive it? The process went pretty fast. I made the crepes yesterday morning. Then fixed the rest late afternoon. They are the best nachos that I have fixed. Have fixed a lot in my days with 7 kids. Will certainly be on the menu often. Thanks for another good one. Enjoy!!!!!!!!!!!! Awesome! 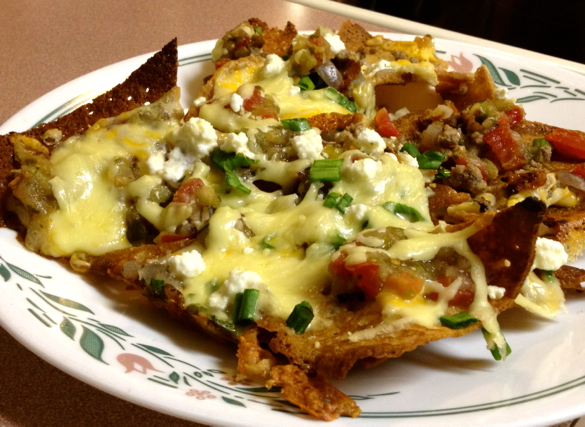 I LOVE nachos – I look forward to the day when I can make mine completely from scratch. I write about radical homemaking and DIY food skills at http://patchworkradicals.weebly.com – check it out if you like! I just wanted to pop in and say that I tried making the sourdough crepes tonight for the first time, and they TURNED OUT:)!! I was so excited with that success. They really weren’t that difficult at all. I had made tortillas and pancakes before, but never crepes, and I wasn’t sure that my big beast skillet would be all that maneuverable (sp? ), but it all worked out great. The instructions were wonderful and anticipated my questions. 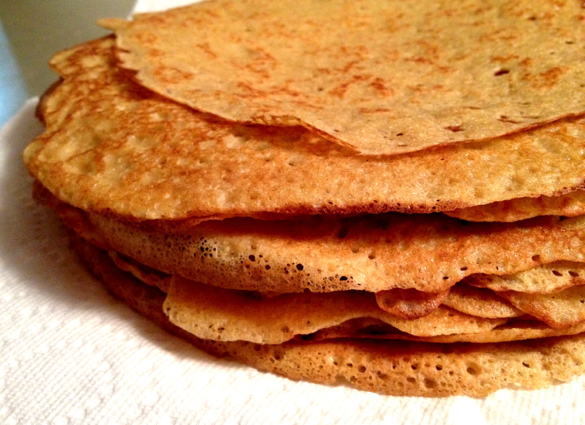 I made the crepes tonight and I’ll try frying them tomorrow, so I’ll see how they do over a two-day process. This encourages me because I have had great success with sourdough crackers and cake, but not so much with the bread yet (still trying). It’s nice to have another sourdough item that works. Thanks so much for sharing this recipe, Wardee. My just-graduated-from-homeschooling daughter has your courses on the top-of-her-list of whats-next:). This looks to be so delicious. I can’t wait to try these out.